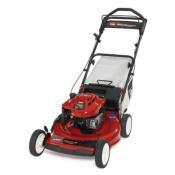 TORO Personal Pace 22 Inch Mower. I purchased this wonderful little mower about three and a half years ago. It has proved to be a faithful grass-cutting workhorse for the past three years. It has always started with just two or three pulls, and provides a nice smooth even cut. I change the oil, air filter, spark plug and blade every season. The greatest feature of this mower is its ability to match speed with the user and allow almost one-handed operation. I have a large yard with several hills and many obstacles, but the little TORO just chugs right through everything. It makes cutting very fast and almost effortless. The personal pace feature, really works as advertised. You can almost jog behind this thing, and it will keep up with you. This mower also allows the option of switching between side-discharge mowing, rear bagging or mulching. I have always left this mower on the mulch setting, and that works well. The TORO blades do a nice job of turning the grass clippings into a fine powder that quickly disappears into the lawn. However do not even attempt this on wet grass. The drive system has recently failed on this older mower however, I was so happy with the performance of this mower; I decided to purchase a newer model. The new models offer hose connections that allow the user to easily wash out old grass-clipping from the cutting deck. Overall, I have to say excellent job TORO, I just wish the drive system would last longer than three years. Just bought one today. It goes back tomorrow. The Personal Pace feature ends up being how fast I can push this mower. It does not have enough power to even push itself on concrete! I was better off with my old MTD push mower, at least it was lighter. I have 2 Toro self propelled mowers. The 21" cut is 11 years old and only showing signs of rusting now. Usual maintenance performed over the years. Use it at our camp in South Louisiana. The other is a 22" cut Personal Pace I have had for 5 years. Usual maintenance performed over the years. The transmission went out on it this year. Worn gear. I will buy the parts and replace the transmission. Love the way both of these cut. love my personal pace Toro Hate the fact that you can't get any infomatation as how to change the oil yourself. if any one knows how please help the rest of us out. I loved it when it worked. I have had my personal pace mower in for service multiple times, its drive is constantly breaking down. It starts grinding, locking up, etc. It needs better quality in the gears and transmission. I had my Toro 10 years. I have loved it. During this time I have replaced the wheels, one of the cables, the drive belt, air filters, and spark plugs. I sharpened the blade myself and changed the oil. I never gave it any special treatment. Kept it outside under a wheel barrow. Today I noticed that the deck was cracked. I think it wore thin from underneath. Motor still starts on 2nd or 3rd pull. For a replacement...Another one just like it. I love it! Starts without a problem. Mows like a champ and self propelled system is great.. It will do laps around any other front wheel drive self propelled mower out there..
And has excellent updraft capabilities for both bagging and mulching like a professional. And for any one looking for an excellent lawnmower I'd truly say stick to Toro mowers. The cut is superior, and looks professionally polished. The self propelled system is definitely a plus. It makes pushing hills and flat surfaces just as easy and convenient. The only negatives are the bulk and the large size of the machine. It is a very wonderful and durable lawn mower. I would highly recommend to anybody who was looking to buy a lawn mower. I purchased this wonderful little mower about three and a half years ago. It has proved to be a faithful grass-cutting workhorse for the past three years. It has always started with just two or three pulls, and provides a nice smooth even cut. I change the oil, air filter, spark plug and blade every season. The greatest feature of this mower is its ability to match speed with the user and allow almost one-hand operation. I have a large yard with several hills and many obstacles, but the little TORO just chugs right through everything. It makes cutting very fast and almost effortless. The personal pace feature, really works as advertised. You can almost jog behind this thing, and it will keep up with you. The drive system has recently failed on this older mower however, I was so happy with the performance of this mower; I decided to purchase a newer model. The new models offer hose connections that allow the user to easily wash out old grass-clipping from the cutting deck. The Toro personal pace mower is a great lawn mower for sure. It is a little bit more expensive than other brands with comparable features, however it has a great warranty and service. Overall, it is also just a better built lawn mower. I bought it on a recommendation from a relative, who has had multiple Toro model lawn mowers that have worked great for 10 to 15 years. He has also had one hundred percent success with his use of the warranty, as Toro has immediately replaced any parts that didn’t work correctly (which only happened a few times). The lawn mower was easy to use from the beginning, being quite simple and straightforward to put together. It starts quite easily as well. The personal pace feature is definitely a strong point, as the mower moves based on how you push into the handle (thus automatically adjusting to your walking speed). The bag is simple to change, hooking on quite easily. It also comes with a great side mulcher, which I have used when our grass was quite long and somewhat wet. It also has a place to screw a hose into after you are done mowing, so it automatically cleans up the mess inside the lawn mower. My only wish would be next time to get a slightly wider mower. It would also be nice if the wheels could be adjusted to just a slightly higher position for longer grass, but the multiple available heights are not bad. I would definitely recommend this or any other Toro lawn mower! I had waited and researched lawn mowers for quite some time before deciding which model to buy. I decided to purchase the Toro Personal Pace lawn mower once I had saved up enough money for the purchasing price. When I bought it, I just couldn’t wait to get it home and try it out. The first thing that struck me about the mower was how beautiful a machine it was. I was amazed at the raw power of the mower that is evident merely form looking at it. Then I decided I better read the instruction manual prior to use (sorry guys I didn’t want to chance screwing the machine up). Reading the manual altered me to the many unique features of the mower, some which ii didn’t even know it had prior to my buying it. Then I turned on the motor for the first time and man did that baby purr, I couldn’t contain myself I had to give it a whirl. The first time I mowed the grass I was amazed at the control I had steering the mower and the even cut it gave my lawn even on the hillier areas of my lawn. It’s been about a year since I’ve had it and I have never regretted once purchasing it and using it cut my lawn. For anyone out there considering the Toro Power Pace lawn mower, I’d highly recommend it if you can afford it. It really gives you a great deal of bang for your buck and a marvelously easy way to care for your lawn. This lawnmower does a fantastic job. It has a 3 in 1 mowing system which works great, allowing you to recycle clippings into smaller bits, bag your clippings or blow the clippings out the side. I find this much easier to use than my old one which only allowed me to bag. I'll use the bag if I have a small job, it's easy to put on and take off. I'll use the side blower for bigger jobs, like my first cut after winter. Either way this lawnmower gets the job done. I haven't had any problems with the blades, besides that they do need oiling a little more often, which isn‘t a big deal at all. When I brought it home it was a very easy set up. I’ve never had a problem getting the lawnmower started after a winter of not using it. This lawnmower is also very lightweight and moves at a fast pace with ease. I read about this lawnmower prior to buying and it was Consumer Reports Best Bet. This Toro is an excellent buy for the money. I looked into buying a John Deere first but considering how much money they cost and the maintenance I've read that they take to keep working I think I used my money much wiser. I would highly recommend this lawnmower (or at least the Toro brand) to anyone looking for a lawnmower. I think that you will find it to be an excellent choice for the price.